The abundance and dry biomass of canopy-dwelling arthropods (insects and small spiders) was tracked over five summers (2010-2014) at four sites near Toolik Field Station, Alaska. At each site, a shrub-dominant and tussock-tundra habitat was chosen for sampling, for a total of 8 sampling locations. At each sampling location, a 100-meter transect was established. Arthropods were sampled along the transect weekly by passing a sweepnet through and over the vegetation. After killing the arthropods with pest strips and freezing, they were sorted from the associated leaf litter and counted. Dry biomass of the arthorpods was estimated in one of two was: using family-level identification, digital microscope measurement, and published allometric length-mass equations; or, arthropds were weighed directly on a microbalance following 48 hours in a drying oven at 50°C. 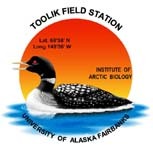 In the summers of 2010-2014, aboveground arthropod abundance and biomass was measured weekly at four sites near Toolik Field Station, Alaska. At each site, a 10,000 m2 shrub-tundra and tussock-tundra plot were designated for sampling. An iron rod was driven into the ground near the center of each plot, serving as a center point for 100-m transect. Transect direction was re-determined weekly by spinning a small linear object. Samples were taken at ten points, spaced ten-meters apart, along each transect. A sample consisted of ten back-and-forth passes of a standard 14" canvas sweepnet through and/or over the vegetation, with each pass of the sweepnet spaced one meter apart. Samples were transferred to plastic bags, and arthropods were killed using pest strips. In the lab samples were placed in the freezer for 4-6 hours. Arthropods were then sorted from the leaf litter and counted. Biomass was estimated in one of two ways. In the first "allometric" method, arthorpods were measured individually using a digital microscope camera, identified to family, and familly-specific length-mass allometric equations from the published literature were applied to estimate biomass. Otherwise, arthropods were dried for 48 hours at 50°C and then "weighted directly" on a microbalance. Shannan K. Sweet, Ashley Asmus, Mathew E. Rich, Laura Gough, Natalie T. Boelman, and John Wingfield. NDVI as a predictor of canopy arthropod biomass in the Alaskan arctic tundra. Accepted for publication, Ecological Appllications 2014. NA = missing value; see comments.